Assortment planning is essentially the process of selecting which products to stock. Although this might sound rather easy, there are many important things to consider when selecting your brand’s edit. The big 4 factors are brand identity, category weight, trends and pricing. These factors will influence every decision you make as a buyer. Finding a balance between breadth, depth and a seasonal trend mix is key to creating an attractive selection. Breadth refers to the different kinds of products you are carrying. An example of having a wide product range is having tops, bottoms, accessories, bags and shoes in one collection. Depth refers to the number of variations one product is offered in. An example is stocking one style of shirt that comes in 5 colours or patterns. A seasonal mix is a certain season or trend based items that might only be stocked during particular times of the year. For winter, you might decide to carry puffer jackets, knitted sweaters or hats while during the summer, you may want to carry swimwear. The same concept applies for festivities like Christmas, as you might opt to stock more red or green outfits. Historically, buyers relied on past sales data, trend forecasts or just pure gut instinct… but they’re simply not enough. New technologies such as data analytics can assist buyers in making more factual-based choices using real-time sales data. To understand how to build a wide assortment, we will be looking at how Zara and H&M stocked their assortment. 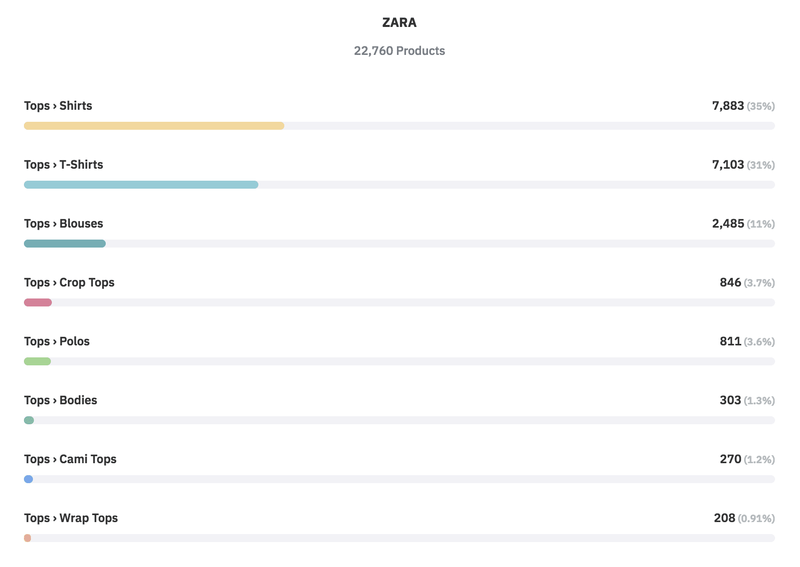 Zara and H&M stocked products for both genders but their main focus was in womenswear, with 64% and 60% contribution respectively. For those planning to stock both genders, do keep in mind the size of the markets – a 60:30 ratio seems to be the most common among fast fashion retailers. Here, you can see how wide Zara’s assortment is. They offer various product categories with the biggest being Tops which has over 20,000 SKUs. The categories should also vary according to the seasons as this example was taken from winter, the second largest category was outerwear. Buyers usually set a top:bottom: dress ratio in their assortment plan according to past sales for each category. You can also filter down to subcategories to understand the different styles of products offered. Under their biggest category which is Tops, you can see which style they stocked the most. According to this timeline, Zara had a high concentration in shirts and t-shirts. Most retailers usually stock the style which garnered the highest sales. 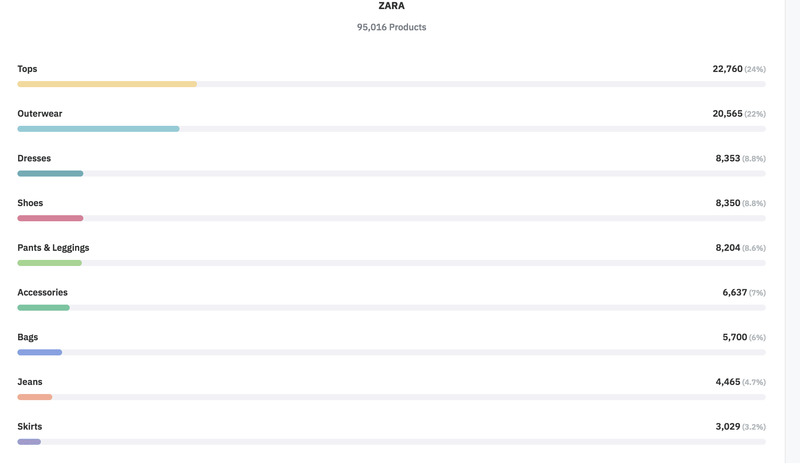 The chart above tells us that shirts and t-shirts performed the best for Zara. Zara prefers to focus on product variety rather than depth but their basic items are usually offered in multiple colours. 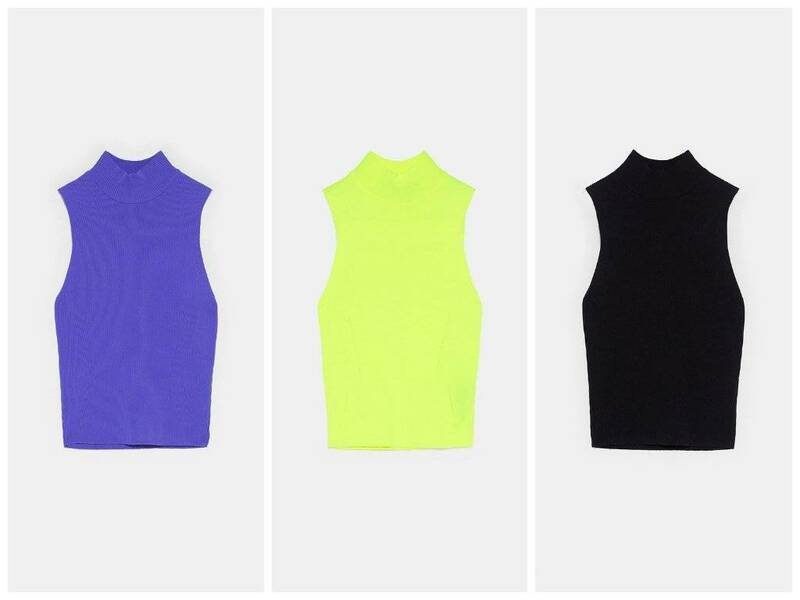 An example is this high neck top which is offered in 3 colours; black, purple and yellow. It is not necessary to have colour variations for every item but for basics such t-shirts or tank tops that can be worn for various occasions, so you can start by offering 3 colourways. The colour schemes should also be updated according to seasonal or trend changes. As this example was taken during Winter 2018, Zara’s colour schemes were heavier in darker colours such as black, white, brown and grey with a few festive colours such as red. During summer this colour scheme will be changed to match the season such as yellow and orange. This should give a deeper understanding of how Zara spreads their assortment by gender, categories, subcategories/styles, options and colours. Go to Omnilytics Competitor Benchmarking page. Select a retailer of your choice, along with any filters, market or timeline of your choice. Scroll through by assortment, price, discounts, gender, colours and more. Click on any element to view products under each category. To have a better understanding of the products, you can sort the products by ‘New Arrivals’ or ‘Best-sellers’.